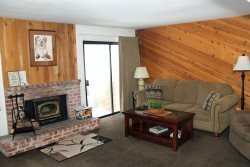 Above Standard, 2 Bedroom & Loft & Three Bath Town home in the Scenic Meadow area of Mammoth Lakes. Sleeps up to 8 (approx. 1300 sq. Ft.). You enter the unit on the first floor which has both bedrooms and 2 full bathrooms, the second floor is the living room, kitchen, dining room and 3rd full bath and the third floor is the loft (open in to the living room by a half wall). The first bedroom has a king bed, the second bedroom has a queen bed, and the loft has two double beds and one twin bed. 4 TVs including a large flat screen in the living room, VCR, DVD players. Phone in unit 760- 924-7850. Wifi Internet Access in the unit. This is a quiet end unit with nice views. There is a washer/dryer in the unit. There are a maximum of 2 outdoor parking spaces available. Snowflower Features a Hot Spa and Sauna, Summer Time Only Swimming Pool, Tennis Court, and On-Site Laundry. There are no Buses, Motorhomes, Trailers or any type of Towed Vehicles allowed on the Snowflower property. COMPLIMENTARY INTERNET and CABLE TV are provided, however NO REFUNDS will be given for connectivity problems or Internet failure. Great spot! Super comfortable and the reservation team was very accommodating and helpful! We had a great time, thank you! Great location!!! Check in and out was easy!! Your place was beautiful! Thank you for letting us stay. Very clean town-home with a well-stocked kitchen. The shuttle stop is right across the street and its about a 5 minute ride to Eagle Lodge, very convenient!